IBF World Super Welterweight Champion Jermall Charlo’s 4th Round TKO victory over challenger Wilky Campfort earned him top honors for the Thanksgiving month in the Bayou City. The Champion improved his ring ledger to 23 – 0 with 18 knockouts coming by way of the Sominex route with the win on the PBC series that was televised by NBC. 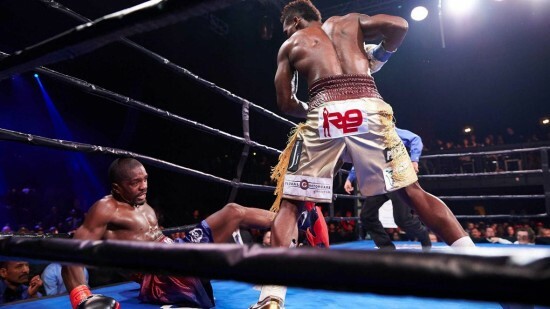 Charlo kept his victim on the end of a long and punishing jab which he followed up with blistering right hands and thudding hooks to drop Campfort three times before his challenger surrendered. Charlo has improved and matured to the degree that he is quickly closing in on becoming one of the world’s top ten fighters. As is our usual custom here at the CBZ, the annual Houston Boxing Awards will once again be presented this year the day after Christmas. There will be a new Fighter of the Year named for the first time in five years as Marlen Esparza did not repeat in 2015, so be sure to check it out. Until next time; good training, good fighting or whatever floats your boat.